Graduation was — well, a few weeks ago now. We see them come and go three times a year, and often forget what a landmark it is for those participating. This Spring, one of the students in our lab was chosen as the student commencement speaker for the College of Engineering. A video of this speech is here. Congratulations, Andre. And the rest of the Class of 2013! Marvin Minsky’s Society of Mind was my first exposure to the notion that our early concepts — those things we learned to believe first — are the hardest to change. The reason is that so much else depends on them. They are like our mental alphabet, and modifications risk collapsing the structure of our thoughts and beliefs. (John Holland and others showed similar results for genes, but that’s a story for a different day.) The more complex and experienced our minds become, the more inflexible. It’s not biology so much as it is mathematics. So we are born with an expiration date. As long as the world changes around us, we will continue to be left behind. Whether this is by accident or design, we are unlikely to alter it. My grandfather was born to a world without cars, radio, or electricity. * He didn’t get running water inside the house until he was in his sixties, and still preferred the walk to the outhouse when weather permitted. I suppose relieving oneself in the house is a concept that requires some getting used to, if you didn’t grow up with it. I don’t think he ever had a telephone, and he managed to live eighty-four years without stepping on an airplane. 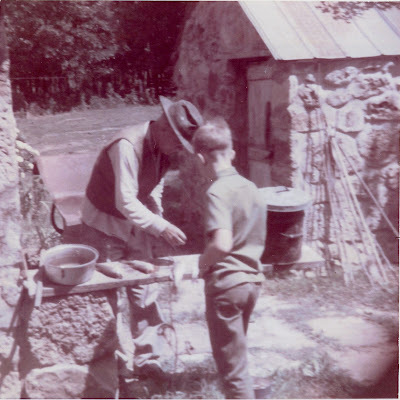 My grandfather and myself in the “initial food prep” area of his farm. The smokehouse is in the background, with his impressive collection of walking sticks. Just out of the frame to the right is a spigot that delivered the only running water on the farm. My parents’ generation was forged in a global depression sandwiched between the two most destructive wars our civilization has ever experienced, harbingers of the promise and potential horror of globalization and technology. Fortitude, stability, and duty were their watchwords. Their world was a hard and dangerous place. The wise were prepared for anything. They believed in citizenship and strong social institutions. If they were the greatest generation, it is likely because they lived the greatest challenges. My lot grew up in the Cold War. Whether we were playing cops and robbers, cowboys and Indians, Allies and Nazis, or something else, there were good guys and bad guys, and no question of which was which. Science and technology had started and ended WWII, cured polio and smallpox, and were helping us beat the dirty Russkies to the moon. Most families had one car and one working parent. Cokes were a dime and comic books were 12¢. The ‘¢’ symbol was common. We roamed pretty much wherever we wished as children, with the only restrictions that we look both ways before crossing the street, try not to put anyone’s eye out, and be home for dinner. I notice two phenomena as I age. The world moves away from us, in my case with globalization, new technology, complicated politics and 24 hour cable news (rapidly being replaced by Internet channels of all kinds). And we become less interested in keeping up with progress, or maybe it’s that progress seems more of an illusion. I learned enough model numbers as a teenager trying to prove I knew stereo equipment. I have very little interest in keeping up with the newest smartphone features. A dear friend’s father retired from architecture a few years early when his firm computerized, choosing not to bother learning a new way to do a job he had done all his life, and had done better than almost anyone. Like most his age, he eventually learned to e-mail and surf the Internet, but computer technology is neither his friend nor his constant companion. While many of us never lose our fear of death, we begin to lose our place in life. The present becomes at once lonelier, more confusing, and more mundane. We fill the void by investing heavily in memories of the past and hopes for the future. On the other hand, no one appreciates a day like a person who doesn’t know how many more they will see. The countability of our moments gives them meaning. I think it’s impossible for the young to fully appreciate this, but it is no problem for someone who attends funerals as regularly as the rest of us go out to dinner. Every time I think of how I miss my father, I am reminded. The result (and possibly the cause) of all this is that the little things — family, friends, the sun in your face on a perfect day — become the big things in life. The title on a business card, h-index, or the number of Twitter followers and Facebook friends fade in comparison. At least that’s how it seems to be working for me. I’ve always believed that we should enjoy our days, because the clock is ticking. It’s only been in recent years that I have decided I’m okay with that. * Technically, all of these things existed when my grandfather was born. They just weren’t at all common. Sort of like Segways. I wrote the post about the IKEA effect as a sort of personal admission that the software architecture I have been developing was just not that interesting or useful. A few days after I published that post, I received notification that a paper I wrote on the topic had been deemed interesting enough for conditional acceptance in a conference that accepts less than one in five submissions. I still believe it’s important not to allow oneself to get too attached to one’s own ideas, but it is also important to trust in our own vision. Like most things, I suppose the secret is finding a balance.